There's a nice little urban space in Rosslyn that is a good example of how several organizations working together can make a small but positive impact on the urban form. It's called CentralSpace, and it's pictured here. What would typically be a weedy, fenced-in lot awaiting groundbreaking has been transformed into a usable, aesthetically interesting urban space. JBG Companies will be building a million square foot, 2-tower development on this space, located at the corner of Wilson and N. Moore Streets in Arlington. 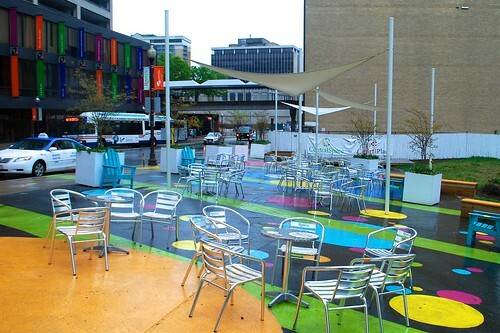 While they continue to secure tenants in order to begin construction, they have teamed up with the Rosslyn Building Improvement District and Rosslyn Renaissance to create this attractive outdoor space. It also includes a rain garden to help reduce runoff. According to the Rosslynva.org website, the idea to use this space in this manner came from the planning organization, Rosslyn Renaissance, and was a cooperative effort among them, the Rosslyn BID and JBG Companies. Volunteers were also engaged to help clean and paint the space, so it was a total community effort. On the few occasions I have had to go past CentralSpace, it appears to be getting regular use. Cities are constantly in flux, with new development replacing old and changes being made to our urban forms. Well executed and creative ideas like these can make the perpetual evolution that much more pleasant and exciting.